With the aim of enhancing the quality of the environment, the world is now focusing on developing innovative solutions to curb the detrimental effects of non-biodegradable materials across the globe. The Bio-degradable packaging is one such solution which is environmental-friendly and could easily be degraded in few days or weeks. The global biodegradable packaging market is expected to grow at a CAGR of 14.2% over the forecast period i.e. 2015-2021. The market of biodegradable packaging is driven by various factors such as increasing regulations of government to reduce the non-biodegradable wastage. Moreover, the global biodegradable packaging market is anticipated to account exponential sales of USD 17.9 Billion by the end of 2021. On the basis of material used in packaging, the market is segment into plastic and paper bio-degradable materials. With 95.1 % of market share, the bio-degradable plastic packaging is the most preferred packaging material however, the bio-degradable paper packaging is anticipated to occupy the largest market and witness a burgeoned growth during 2015-2021. The global bio-degradable packaging market is divided on the basis of applications as food packaging, pharmaceutical packaging, beverage packaging, etc. At present, food packaging leads the market with 70.2 % of share, although beverage packaging is expected to witness the highest growth in coming 5-6 years. Rising inclination of people towards use of environment friendly products is one of the major growth drivers of the bio-degradable packaging industry. In addition to this, rising initiatives of the government for manufacturing of bio-degradable materials also projected to escalate the bio-degradable packaging market. However, huge differences between the price of bio-degradable and traditional/conventional packaging materials is a major obstacle in front of the global bio-degradable packaging industry. 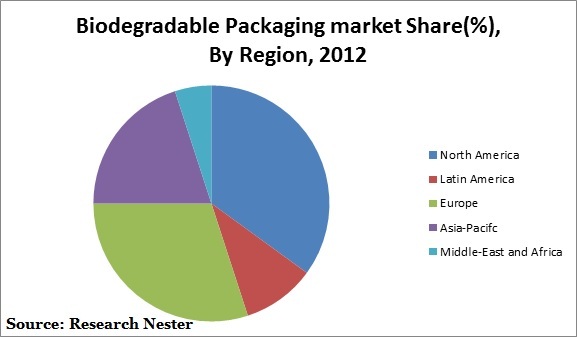 Regionally, North America has lion’s share of the global bio-degradable packaging industry. Country wise, the U.S. is the largest market (in terms of consumption) of bio-degradable packaging in North America and is anticipated to flourish at a burgeoned pace in the future. The European government has planned to reduce the consumption of conventional plastic bags in the region by 80% points in the next 5-6 years. On the back of this step, the bio-degradable plastic industry in Europe is anticipated to flourish at a healthy CAGR of 12.3% during the forecast period. U .K. and Germany are the two major markets of bio-degradable packaging in Europe at present. The market of bio-degradable materials in these countries is majorly driven by the strict enactment of environmental friendly government regulations and continuous innovations and research in the packaging industry. The global bio-degradable paper packaging market is dominated by the Asia Pacific region followed by Europe and North America. This region is also anticipated to occupy 34% of global bio-degradable plastic market by 2019. Country wise, India and China are the two major markets of bio-degradable packaging in India. The paperboard packaging industry of India is anticipated to witness a burgeoned Y-O-Y growth rate of 11.5 % during 2015-2021. The capacity of bio-degradable plastics in China in 2014 was around 382 Kilotons and with major bio-degradable plastic projects like PBSA Phase II, the market would surely get fuelled in the coming future. The global bio-degradable market includes, but not limited to major players like International Paper, Biopac, Natureworks LLC, Stora Enso, Clearwater Paper Corporation, Novamont S.P.A, Georgia-Pacific LLC, Rocktenn, Mondi Group, Smurfit Kappa Group, Kruger Inc. and BASF SE.